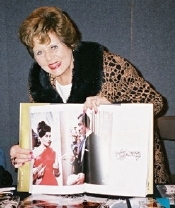 Eunice Gayson with my Bond Girls book that she had just signed. Eunice's daughter, Kate, appears as an extra in a later Bond film Goldeneye (1995). 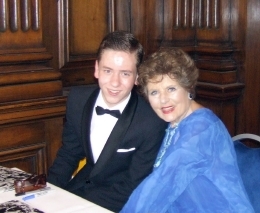 I have met Eunice Gayson several times but it was especially good to see her at the 'Bond Girls Are Forever' event at Pinewood, in July 2006, as she was the very first Bond girl of the official 007 series. Eunice Gayson's first film appearance was in My Brother Jonathan in 1948, when she was 17. She had small roles in many British films of the 1950s and these included Revenge Of Frankenstein (1958) with Peter Cushing and Zarah (1956) with Victor Mature and Anita Ekberg. Zarah was written by Richard Maibaum, directed by Terence Young and co-produced by Cubby Broccoli. All three were to go on to produce the first official Bond film, Dr No, in 1962. 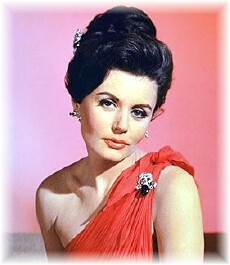 It was Terence Young who would cast Eunice Gayson in the film, saying that she "always brought me luck in my films." As Sylvia Trench, Eunice Gayson became the very first 'Bond Girl' when, in Dr No, she meets 007 (Sean Connery) at the casino and loses to him at cards. She says to him, "I admire your luck Mr......" to which he replies with the immortal words, "Bond, James Bond." Sylvia Trench reappears in the second Bond film From Russia With Love, when she is having a picnic with 007 until he is called away by M.